Arsenal missed out on a place in the Champions League for the first time in 20 years despite beating Everton on the final day of the season. Arsene Wenger's side got the win they required despite having defender Laurent Koscielny sent off for a reckless first-half challenge on Everton's Enner Valencia. He will now serve a suspension that will keep him out of the FA Cup final against Chelsea at Wembley. Arsenal took the lead early on through Hector Bellerin's far-post finish and Alexis Sanchez scrambled in a second after Koscielny's dismissal to put the Gunners in control. It was to no avail as Liverpool completed their task by beating Middlesbrough to finish fourth. The Gunners did end the league campaign with a flourish though thanks to Aaron Ramsey's brilliant injury-time strike from 20 yards after Romelu Lukaku pulled a goal back for Everton from the penalty spot. The hosts, who also had defender Gabriel taken off injured on a stretcher, now turn their attention to Wembley, after which an announcement on manager Wenger's future will be made. Arsenal's failure to reach the Champions League will come as a seismic shock to a club that has made it their permanent home for the past two decades - but supporters will hope it acts as a wake-up call. The Gunners have dropped away from the serious title challengers in recent years and the failure to make Europe's elite competition brings the recent decline under Wenger into sharper focus. Arsenal cannot afford to be fooled by the recent improvement in performances or even if they win the FA Cup against Chelsea at Wembley. There is still real talent within the team and the idea of losing talisman and inspiration Sanchez is unthinkable. But results have proved once more that they are nowhere near title-winning material and yet another exit at the last-16 stage of the Champions League is a brutal reflection of their wider status. It now looks certain Wenger will be staying as manager and there can be no excuses for a disappointing league campaign. Arsenal's supporters set aside any discontent aimed at Wenger to give their side full support as they chased the unlikely possibility of a place in next season's Champions League. And it was only when news broke of Georginio Wijnaldum scoring for Liverpool against Middlesbrough at Anfield that the voices of rebellion were heard. In the second half, loud chants of "Stan Kroenke get out of our club" echoed around Emirates Stadium in protest against the American owner who many Gunners fans feel has presided over Arsenal's recent relative fall from grace. There was also a small number of protest banners unfurled after the final whistle as Arsenal's players waited to go on a lap of appreciation. It was also done against the backdrop of Kroenke ignoring a £1.3bn takeover bid from Arsenal's other main shareholder Alisher Usmanov, who holds a 30% stake in the club. An appearance in the FA Cup final and the possibility of ending the season with a trophy has perhaps put serious protests on the back-burner - but there is still unhappiness lurking not far beneath the surface from a fan base who are demanding better. The boss is saying after the FA Cup final they will make an announcement on his future but he looked very despondent in his interview. We don't know what's happening. The fans are protesting against the owner. I feel like his silence is deafening. Fans would like that and for the owner to start backing the team. I would like Wenger to get backed more - I won't say he should go. Everton's form has fallen away badly since they secured Europa League qualification - a successful return for manager Ronald Koeman in his first season considering the fiasco he inherited from his predecessor Roberto Martinez. And the flaws he needs to address were all on show here, particularly in a desperate first 45 minutes which had an almost farcical air, with Everton defending appallingly and finishing equally badly when they were presented with acceptable chances. One sub-plot to this finale was the subject of Ross Barkley's future as Koeman insists he must make a decision within days after rejecting a new contract. Barkley was dropped from Everton's starting line-up, with Koeman insisting his exclusion was purely tactical - although he was on for Tom Davies inside 26 minutes as they struggled to contain Arsenal. Koeman will have no hesitation in selling Barkley as he knows he needs to address several key areas of his team as well as await developments on the future of striker Lukaku. The Toffees need a quality goalkeeper, reinforcements in central defence where Phil Jagielka and Ashley Williams were run ragged, more goals from midfield and help for Lukaku if he stays. Koeman will be heavily backed in the transfer market by major shareholder Farhad Moshiri who is fiercely ambitious, so this is shaping up as the most important summer in Everton's recent history. Arsenal manager Arsene Wenger: "It is annoying but we had a spell during the season that was difficult and it was difficult for me in my personal situation. We were playing in a hostile environment. The players came back stronger in the past two months and I'm very proud of them for doing that. "I was focused on my job. I am professional. I love this club enough to do my best every single day. One thing you cannot question is my love for this club. I've turned down every club in the world to stay here." Everton manager Ronald Koeman: "It wasn't good enough. We saw today what we need for the next season. We need more productivity out of possession. That's the difference between us and Arsenal. "We did everything to win the game but we had to score in the first half. It was a long time 11 v 10 and a penalty isn't enough." Despite victory, Arsenal have finished the season outside of the top four for the first time since the 1995-96 campaign, when they finished fifth under Bruce Rioch. 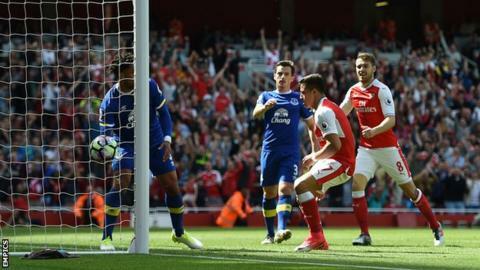 Everton are now winless in their past 21 away league games against Arsenal, last beating them in London in January 1996 (2-1). The Gunners have scored 95 Premier League goals against Everton - more than any club has against another in the competition's history. Danny Welbeck provided two assists in a single Premier League game for only the second time - the other was in April 2012 for Manchester United, also against Everton. Laurent Koscielny has been sent off five times since his Premier League debut in August 2010 - no player has been red carded more in that time [Tom Huddlestone and Younes Kaboul also five]. Koscielny's red card was the second time he's been sent off in the opening 15 minutes of a Premier League game - the only player to have done so more than once [also sent off after nine minutes vs Manchester City in 2013]. Romelu Lukaku scored his 25th Premier League goal of the season - the most goals scored without winning the Golden Boot since Wayne Rooney's 27 in 2011-12. The Gunners have conceded 10 penalty goals this season, one of just two sides in Premier League history to ship double figures of goals from the spot [Hull, 11 also this season]. Arsenal have a Wembley date with Chelsea in Saturday's FA Cup final. Everton and Ronald Koeman can now turn their attention to maintaining and building a squad for next season. Match ends, Arsenal 3, Everton 1. Second Half ends, Arsenal 3, Everton 1. Attempt missed. Ross Barkley (Everton) left footed shot from outside the box is close, but misses to the right. Assisted by Romelu Lukaku. Attempt saved. Danny Welbeck (Arsenal) right footed shot from the centre of the box is saved in the centre of the goal. Goal! Arsenal 3, Everton 1. Aaron Ramsey (Arsenal) right footed shot from the left side of the box to the top right corner. Assisted by Mesut Özil. Attempt missed. Ross Barkley (Everton) left footed shot from outside the box misses to the right. Assisted by Morgan Schneiderlin. Attempt saved. Alex Iwobi (Arsenal) right footed shot from the centre of the box is saved in the bottom left corner. Assisted by Mesut Özil. Corner, Everton. Conceded by Héctor Bellerín. Attempt missed. Danny Welbeck (Arsenal) header from the left side of the six yard box misses to the left. Assisted by Héctor Bellerín. Attempt blocked. Alex Iwobi (Arsenal) right footed shot from the centre of the box is blocked. Assisted by Héctor Bellerín. Substitution, Everton. Arouna Koné replaces Enner Valencia. Attempt missed. Romelu Lukaku (Everton) header from the centre of the box is high and wide to the left. Assisted by Gareth Barry. Attempt missed. Enner Valencia (Everton) right footed shot from the right side of the box is high and wide to the right. Assisted by Romelu Lukaku. Attempt missed. Phil Jagielka (Everton) header from the centre of the box is too high. Assisted by Kevin Mirallas with a cross following a corner. Attempt blocked. Gareth Barry (Everton) header from the centre of the box is blocked. Assisted by Mason Holgate with a cross. Attempt blocked. Ross Barkley (Everton) left footed shot from the left side of the box is blocked. Assisted by Leighton Baines. Attempt missed. Kevin Mirallas (Everton) right footed shot from outside the box is just a bit too high. Assisted by Leighton Baines following a corner. Attempt saved. Mesut Özil (Arsenal) left footed shot from the centre of the box is saved in the centre of the goal. Assisted by Aaron Ramsey with a through ball. Substitution, Arsenal. Alex Iwobi replaces Alexis Sánchez because of an injury. Foul by Enner Valencia (Everton). Attempt missed. Gareth Barry (Everton) left footed shot from outside the box misses to the right. Enner Valencia (Everton) wins a free kick on the right wing. Quiz: How well do you remember the 2016-17 season? Read more on Premier League quiz: How well do you remember the 2016-17 season?